February is Feline Dental Health Month—or so I hear. I, for one, don't celebrate anything that has to do with getting rammed into the old PTU and taken to the V.E.T. How many of you let your humans brush your teeth? That not many of you … not many of you. If you're like me, when you see your peeps looking at kitty toothbrushes in the pet store, you say three little words. Make. My. Day. That's certainly enough to get my peeps to move on to the more important aisles like the noms and toys. I'm doing my Dracula impersonation. Notice the pearly whites. Did your V.E.T. tell your peeps that you were getting tartar and they should be brushing your teeth? *Nodding* I thought so. What if I were to tell you of an all-natural product that would serve the same purpose as a tooth brushing? A product that had no taste, no odor and no color and will give you control for taking care of your own teeth. I'll bet you'd all buy into a product such as this. Ark Naturals has the answer for you. They make two different formulas: Breath-Less brushless toothpaste is chewable tablets for dogs older than 12 weeks and okay for cats who like the taste. I presume it tastes like cinnamon and cloves since they're two of the active ingredients. Ark's patented toothpaste center controls plaque, tartar and bacteria causing bad breath. Pretty cool, right. It's gets better. The tablets contain no wheat, wheat gluten, corn, soy, sugar, yeast, animal protein, or artificial colors/flavors. You also won't find any chlorine ingredients, stabilized chlorine dioxide, anthium dioxide or artificial colors. 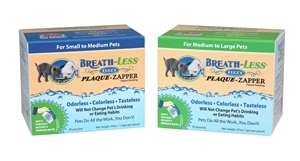 If you're a fussy cat such as myself, they also make Breath-Less Fizzy Plaque Zappers for cats and dogs over 12 weeks old. All your peep has to do is empty one convenient packet into your water. If you don't drink water or if use a fountain, the colorless, tasteless, odorless powder can be sprinkled on stinky goodness. The natural enzymes work with the pH in your mouth to prevent plaque and tartar from sticking. The enzymes stay active for up to 8 hours. Yeah, unfortunately, it won't work with fountains since the filters filter out the enzymes that do the cleaning. 2 times daily for 4-6 weeks for therapeutic use and then once a day for maintenance is what is recommended. Cousin Fluffbomb. Isn't he handsome? I just got a few samples to try so I can't vouch for the many positive reviews on Ark Naturals web site. My Aunt Karen says that my doggie cousin's brown tartar was actually gone after 2 months of use and her breath got better in a few weeks. 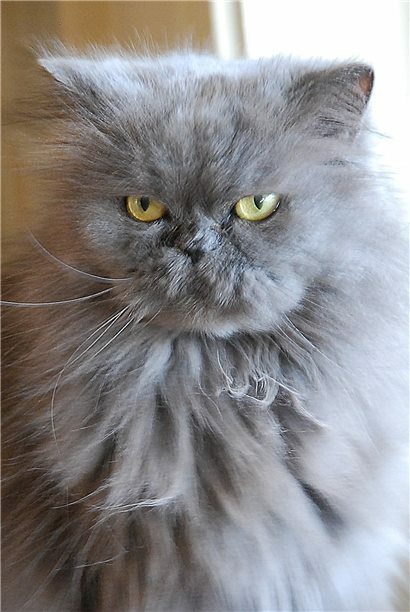 I checked with cousin Fluffbomb, who confirmed it and he wouldn't lie to me. This product won't break the bank either. It's a lot cheaper than a cleaning at the V-E-T. The fizzy formula is about $14 for 30 packets and a 4 oz. bag of the chews is about $6. You can buy them online directly from Ark Naturals or your favorite sites like drugstore.com, PetFoodDirect or PetHerbsDirect; or find them at such stores as Vitamin Shoppe, Basic Foods, and most pet stores. Disclosure: I was given a few samples of the product but the words are my own. Neither Ark Naturals or anybody else puts words in this ghetto cat's mouth. What a Koinkidink! Next week, Me ( Cecil) has to be shoved in the dreaded PTU for a trip to the V.E.T for a Dental.....YIKES! Mom says itz my own faults cuz I only eat Stinky Goodness and turns my noze up at kibbles. Darling, darling, darling--Here I come, all atremble with anticipation at reading of your exciting escapades, and what do I see? Dental hygiene chat? How.....deflating. But that picture of your Fangs *is* strangely exciting. Hmmmmmm. Thank you CK for your great review. These products keep my pearly whites white! This definately beats going to the vet and having them do my teethies!! CK that was a great sell job - I'm sold totally. Only one problem, I has no toothies. I bet that stuff does work tho because you made it sound like it would and I trust you! (Besides, I don't want to get bit and neither does M). he he - seriously, that sponsor should be proud of the good job you did. Cousin Fluffbomb is awesome. I certainly wouldn't doubt anything he has to say! Thanks for the tips -- very useful information, and I am certainly going to buy some Fizzy Plaque Zappers online to give it a try. Thanks also for dropping by to say hello to my Dante! He loves making new friends. Well I never heard of that stuff...hmmmmmm, I'd have to ponder that. Here goes my 4th try on that word verification monster. We've never heard of that stuff either! Will have to check it out. I have gingivitis and get special crunchy food for it. This might open the door to some new food choices! Wow, CK, that sure sounds like great stuff. We sure are not going to have our teeth brushed, that is for sure. So we might have to give this a try,for the dogs too. Thanks for this great review. Oh and by the way, Spitters says he would love to dance with you. He will be over to pick you up. Take care and have a great week end. hate to tell you but my Mom DOES brush my teeth.......when she thinks of it! Hi CK, I brush my kids' teeth every other day but it is extremely difficult for one of them. He does not like it at all. Thank you for your review for Ark Naturals. I will check their website! Hey--I know I wrote a message here last night--was it censored during moderation??? Ha ha ha! I forget what I said, but I am sure it was scintillating and kingly ;-) Hope all is well in Cathy-K land, my sweet! 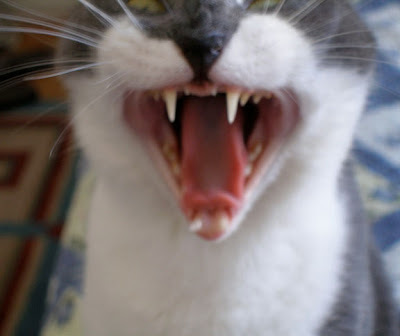 My mom do brush my teeth´s a couple of times a week with cat toothpaste ! But I have bad breath anyway say´s my dad. Maybe I should try that tablets ?! Sounds good! Mom's tried to brush my teeth, but I'm more interested in nomming the toothbrush! I'll have her check this stuff out, thanks!